This four piece coaster set is constructed out of wood and leather, making it ideal for promoting bars, restaurants, and catering services. This is a great product to have for personal use at home or when entertaining guests at nightclubs and lounges. 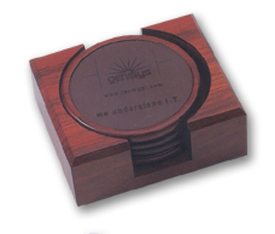 Laser engrave this choice coaster set with your company name and logo to gain valuable exposure whenever refreshments are served. Standard packaging is a gift box. Logo set-up: $50.00(G) Straight line text set-up: $25.00(G). Personalization is available and free. One setup per PO. 1st area of engraving is included with no run charge. 2nd area of engraving is $1.00(G). Blank items receive (EQP) End Quantity Pricing. First column pricing plus 20% charge for less than minimum quantity ordered. Rush service available up to a 1-day production time. Engraving Area: 3" x 3"